Hello from America! It looks like you will be getting our former starting goalkeeper. Strange how things work out, we thought he was our future but a finger injury gave our backup goalkeeper a chance to play and he played incredibly well so far. He also has much lower wages than Adam! Kwarasey has helped us win the cup and was a good media and field presence so we will miss him. He is a former V�lerenga and Str�msgodset-player (not to mention, he is Norwegian), so most of us are familiar with his goalkeeping abilities. He is brought in to cover up for Andre Hansen (our number one goalie) which is currently injured. So he may end up on the bench here as well when Hansen returns. But thanks for the input, and good luck with your season! And please buy Christian Gytkj�r. He is in many ways the Danish equivalent of Lionel Messi. Spread the word. First of all, I Just have to put it out there: Your Tifo game is absolutely incredible. I also watched you guys in Vancouver last year, and the support was great, even though the MLS does not seem to allow too many away fans in the stadium. Dew, with that beard Christian belongs in Portland! Our striker may be sold this winter so who knows what will happen. Our general manager has a tendency to sign players that are unknown in the US. Pokie, I am glad that the Army was able to entertain. Though I can take no credit for the tifos as I don't live in Portland the organization certainly make it easy to be a proud member. Positioning isn't bad but probably his weakest area. You can see sometimes he doesn't commit to one strategy when the defense gets sliced open. He was behind a strong defensive line for 2015 so wasn't terribly busy. 13 clean sheets, tied for best in the league and won save of the year thanks to his reflexes. That said he improved most on communicating with other players. You could see at the start that he wasn't always on the same page as the CBs but that improved immensely as the season went on. Maybe because he comes across as a reserved individual in general it takes time to warm up to his teammates. Though he had a rep as a locker room cancer with Ghana the opposite is true with Portland. In spite of the occasional boneheaded play he always stepped up when it counted and for that I will always be grateful. Maybe because he comes across as a reserved individual in general it takes time to warm up to his teammates..
That shouldn't really be a problem, Norwegians are known to be quite reserved people. Just like Americans are known to struggle with sarcasm. But, Christian Gytkj�r is an absolute beast. 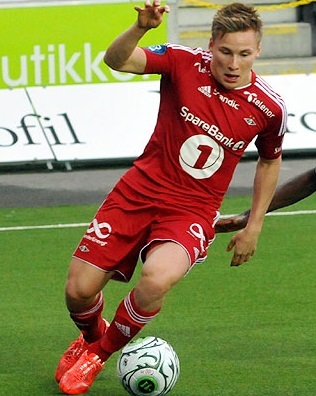 Having teared the league to shreads at previous club Haugesund, he is now our very own Ronaldo. He shoots as hard as a horse kicks, and runs like a Tornado. He would set the MLS literally on fire. The squad will be reduced to 23 players, but I can't see any of the three goalkeepers being left out. Ghana will play Uganda, Mali and Egypt 17, 20 og 25 January. An open question whether Kwarasey will return to Trondheim after the tournament: Before christmas he visited Minnesota United, and he was not pleased with being benched in September. Grant also handed a late-call up to Enyimba Stars goalkeeper Fatau Dauda to replace injured Adam Kwarasey. GHANASoccernet.com understands the Norway-born will have to go under the knife to solve the problem. Ghana goalkeeper Adam Larsen Kwarasey has denied reports he will undergo surgery for the injury that ruled him out of Ghana's AFCON participation in Gabon in January. "It's a minor injury," he said. "There is no surgery required; just treatment for lower back pains. The former Portland Timbers goalie also explained why despite it being a minor injury, he still decided not to risk staying in camp. "The reason I am not going [Gabon] is because I decided that it will not be fair to go if I am not sure I can contribute from day one. I was the one that said it's better to have three available goalkeepers for a tournament as difficult as the AFCON." The 29-year-old however admitted that he "could be fit during the tournament or right before it starts." Adam Larsen Kwarasey has joined Danish side Brondby from Norway's Rosenborg.